I *think* it came from Wilma, mainly as she was exhibiting some very strange behaviour on Sunday where she dug a hole and then dustbathed in it. Whilst that wasn't that strange... it was the way in which she did it. 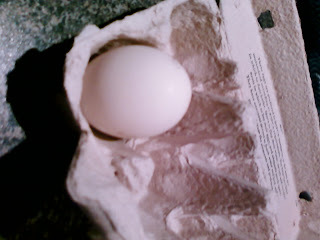 Also as I am expecting Betty (Australorp) to lay a darker coloured egg... but that could just be my misconceptions. And here I was waiting for the crouching behaviour etc and watching for red combs etc.